What I learned Today: Before IMAX: Cinerama Camera Corp. I read, discuss, and discover new things about cinematography everyday. Most of it, I consider incredibly interesting. Everyday I will share one of those things, maybe more if I have time. 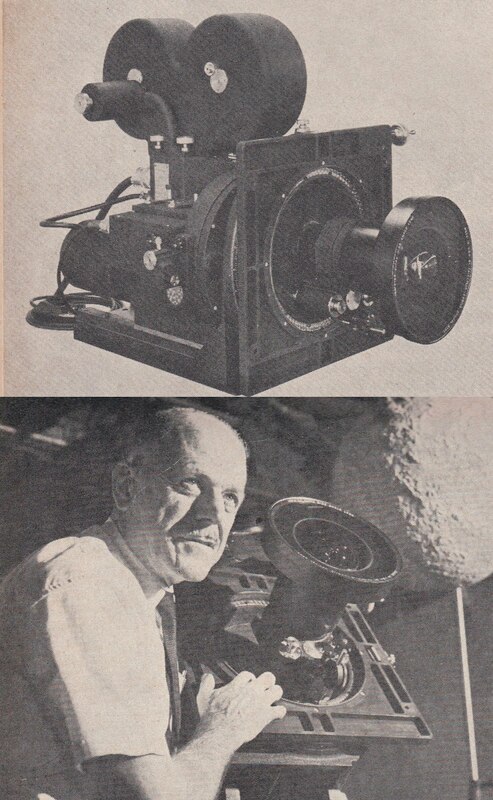 Before IMAX: Cinerama Camera Corp.
SPECIAL CINERAMA CAMERA, shown above, equipped with 0.9-inch, f/2.2 inverted telephoto lens and using 70mm film was employed in photographing "Journey To The Stars," much of it in single-frame exposures. CINERAMA CAMERA CORPORATION'S super-wide angle 70mm camera with "bug-eye" lens features frame counters, forward and reverse operation, single frame photography, dissolving mechanism and special shuttering affording long exposure times per frame. Space-age movie in hemispherical format required novel wide-angle photography and vertical projection on dome-shaped screen. When THE SEATTLE WORLD FAIR opened last summer the "hit of the show" was the Spacearium featuring a new space motion picture system created and constructed by Cinerama for the Boeing Co. and the United States Science Exhibit. Inside the U.S. Pavilion a 15-minute color film, "Journey to the Stars", was projected on a hemispherical 360-degree, 75-foot screen, filling the 6,000 square foot surface with all the excitement of an actual trip to the outer galaxies. During the run of the Fair, standing audiences of 1,000 at a time viewed the spectacle. It played more than 6,000 performances before an audience totalling 4½ million people and springboarded the formation of a vital new company serving the motion picture and missiles industries, the Cinerama Camera Corporation. ...Curtis Optical, assigned the task of designing the lenses, delivered the first one—a 0.9-inch focal length, f/2.2 inverted telephoto—which could be used for both photography and projection. Its resolving characteristics were of a very high order —500-600 lines per millimetre visually on axis and 70-80 on film, with virtually no vignetting at the edges. Its angular field of slightly more than 162 degrees assured sharp projection coverage of the vast hemispherical dome. A .9" lens is roughly the equivalent of a 23mm lens. Nothing super wide in motion picture terms, but this isn't your typical motion picture format. 70mm vertical motion picture film is approximately four times the surface area of 35mm motion picture film! I am always open to relevant, professional feedback, opinions and critical critique. A Whale of a Camera! Ryan Patrick O'Hara 2011. Simple theme. Powered by Blogger.